The Government of France is awarding its prestigious Chevalier de la Legion d’Honneur Medal to Americans who served in France during World War II. They wish to recognize all Americans who served in the liberation of France during World War II. 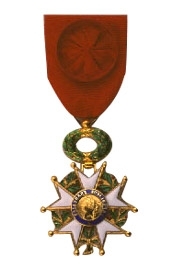 Each American soldier, if approved, will be named French Knight in the Order of the Legion of Honor (Chevalier de la Legion d’Honneur) approved by the President of the French Republic on the 60th Anniversary of D-Day. This award was established by Napoleon in 1802. ANY American soldier who served in FRANCE during WW II must be LIVING at the time of application*, in order to qualify for this award. The processing time is between 6 months and over a year, due to the large number of applications submitted by U.S. veterans. The French Embassy in Washington, DC, the French Consulate General which has jurisdiction over your place of residence in the United States, and the French Ministry of Foreign Affairs in Paris are involved in the approval process. 1. Veteran must be LIVING at the time the application* is filed. NOTE: It is suggested that a Sansei or Yonsei assist with filling out the application form, as the form is very lengthy. * If you need a copy of the application form, please leave your email address in the comment box below.